These creatures magically glide through the air as gracefully as they traverse the oceans. The Nauticans use these creatures to quickly get to grips with enemies out of range of other Nautican units. A vicious poisonous barb extends infront of the stingray when it swoops down upon it's foe. Stingrays are given the gift of flight on the surface world by being bound to a Nautican spellcaster before they make landfall. The army may only contain 1 unit of Stingrays per magic level of the most powerful spellcaster in the Nautican Army. For example, if the army includes a level 3 Mermaid then 3 units of Stingrays may be selected in the Nautican army. 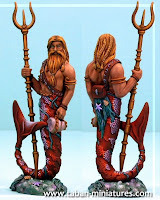 Image from Warpstone Flux blog, used with permission. 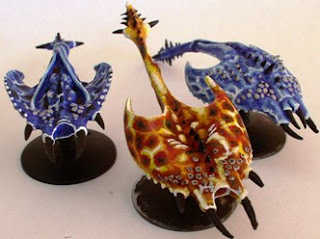 Models are Games Workshop Chaos Screamers of Tzeentch.